Love Like Voodoo is a track that immediately kicks things into high gear. The vocals laid down are reminiscent of The Runaways and The Distillers. There is a certain allure to this introduction that ensures that listeners will stick around with the band long after the track ceases. Like A Woman Would showcases the technical ability of Soraia. While the vocals ultimately settle into the headlining spot, I feel that the arrangements that are laid down for this cut allow the vocals to be properly highlighted. 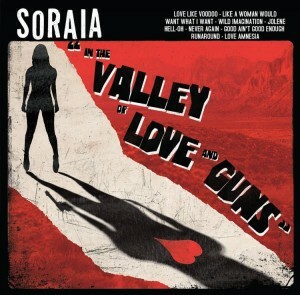 Soraia is able to move into a more rotation-ready rock while keeping the momentum of In The Valley of Love and Guns high. Want What I Want ends the introductory salvo by distilling the essence of eighties rock into a laser-like blend of guitars and vocals. Soraia speak to contemporary fan through honest and chilling vocals. Hints of surf music and Sheryl Crow are studded through this effort, which will have something substantive for fans of all rock stripes. The album ends with Runaround, a track that shows that Soraia can continually innovate and keep things fresh. The track does well in connecting with the previous efforts on the album, as well as showcases the scintillating collection of styles and approaches that the band takes. Make sure to visit their website for more information about the band and to locate a copy of this album. Soraia’s Bandcamp (http://soraia.bandcamp.com) is absolutely perfect, allowing listeners to purchase the CD while having the opportunity to purchase a digital or limited edition version of the album. Check them out today.